It’s September; faculty, staff and many students at UBC Okanagan are rolling out the red carpet to make all newcomers feel as welcome as possible. The campus is expecting to welcome some 1,777 first-year students. The action is already underway for the 341 new international students, as their week of welcome — Jumpstart — began Sunday, August 30. Jumpstart provides international students with the chance to settle in well before the academic term begins. Enrolled students get some academic preparation: research, group work and faculty-specific break-out sessions, and they meet some of their professors outside of the classroom environment. There is also the opportunity for social and cultural activities and some off-campus trips that allow international students a chance to explore Kelowna and the area before they hit the books. Meanwhile, Create, the student orientation program for the remaining new-to-UBC students, whether they are fresh out of high school, or experienced students beginning a new program at the Okanagan campus, takes place Tuesday, September 8. Create is a day-long series of events designed especially for the newest members of the close-knit campus community. Create ice-breaker activities start around 8:30 a.m. at the University Commons. And at 9:30, Interim President Dr. Martha Piper will lead a procession of deans to the stage for a fast-paced, energetic, and fun kick off to the day of orientation events, including a ‘cheer for your dean’ session. The day continues with campus tours, a meet-your-dean session, free lunch, the colour run at 3 p.m. and finally an evening concert. Create is for all new-to-UBC students, says Cull. Every new student, whether they are a graduate, mature, or a transfer student, is welcome to participate in all the Create activities. The first day of classes is September 9, and Cull notes that even though studies have begun, orientation sessions for all UBC students continue with Spark, the five-week extended orientation program. Each week, going right into October, has a theme that is specifically designed to support students as they transition into the campus community. Spark's program includes events and activities in five key themes. 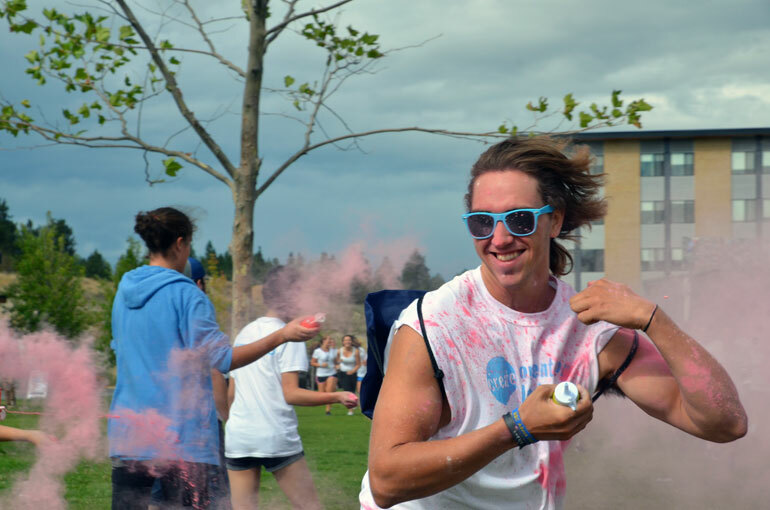 Students are encouraged from the get-go to be involved in the community and make the best of their educational experience at UBC Okanagan, says Cull. Also, he notes, with UBC’s peer mentor program, all new-to-UBC students are paired with an upper-year student in the same academic program. Peer mentors are there to help new students and provide support as they adjust to life on campus.